Every year in March, the Dutch charity, Oranjefonds, organises a national day for volunteering in the Netherlands, called “NLdoet” (literally translated in English: “NL does”). It was formerly referred to as “Make a Difference Day”, like the American counterpart for this day. The Oranjefonds was founded in 2002 and was a national wedding present for Princess Maxima and Prince Willem-Alexander. 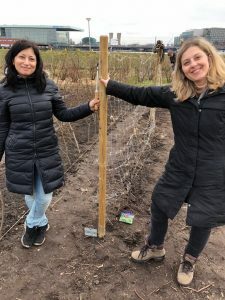 This year, in 2018, Blue Lynx was delighted to be able to join Voedseltuin IJplein and help them with their vegetable patch. Voedseltuin IJplein is a shared vegetable garden for and by local residents of Amsterdam. Most of the organically grown vegetables and herbs are sent to food banks in Amsterdam. We were offered a delicious lunch made by a local resident. After that we were shown how to rake the soil; makes rows in the soil for the plants; and how to sow seeds for vegetables such as sugar snaps, onions, radish, cabbage, lettuce, and lamb’s lettuce. We also had a lot of fun putting the theory to practice and working together as a team in the field. Last year, in March 10th 2017, Blue Lynx had the pleasure of visiting a local Senior Home called Respect Zorggroep (translated: “Respect Care Group”). The staff enjoyed the day by helping to plant flowers and plants on the residents’ balconies; as well as meeting the residents. Where can I find a volunteer job?